The historic Essex brewery Ridley's is to close this autumn after being bought by its bigger East Anglian rival Greene King, it has been announced. Suffolk-based Greene King is paying £46m for Ridley's brewery at Hartford End, near Chelmsford. 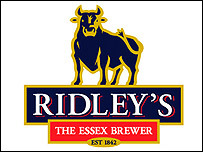 Greene King is also buying Ridley's 73 pubs which are based in Essex, Suffolk, Norfolk and Cambridgeshire. Ridley's, which was founded in 1842, produces Ridley's IPA, Old Bob and Tolly Original. Greene King, which is based in Bury St Edmunds, has 2,064 pubs. Nicholas Ridley, chairman of Ridley's, said: "After many years of running the company as a local independent business, and following long deliberation by the board, we now believe Ridley needs to become part of a larger group. "We view Greene King as the best owner to develop our business for the future." Greene King chief executive Rooney Anand added: "Ridley's has a high quality pub estate, some popular ale brands and a sound local free trade business. "The business is ideally located in a strongly developed part of the country which is close to the centre of our operations." Beer consumer group the Campaign for Real Ale (Camra) called for a Competition Commission inquiry into the deal, as it said Greene King now dominated customer choice in Essex and East Anglia. It said it was concerned about the continuation of a trend which recently saw Wolverhampton & Dudley acquire Cumbrian brewer Jennings for £45.8m. Camra chief executive Mike Benner said: "A new generation of national brewers has been created and is a threat to consumer choice. "Take-overs rarely lead to benefits for consumers and invariably lead to erosion of consumer choice and breweries close and beers are axed." Camra also pressed Greene King to reverse the closure plan for the Essex brewery, which dates back 163 years. Mr Benner added: "Greene King should show they care about Britain's heritage and the views of beer drinkers and attempt to sell the brewery to someone who can use it to brew beer."